A few years back a friend and I went inter railing around Europe and as a result spent a lot of time throwing together lovely little picnics. This was one of our favourites lunches while we were away, and with the lovely weather at the moment I have been craving this summery treat. The only problem was that on our travels, when my waist line didn’t bother me (even though it should have!! ), we had it with fresh baguettes, lots of cream cheese and fresh Italian pesto and a huge packet of crisps. This certainly would not be pro point friendly and so today, still craving away, I decided to see if I could come up with a lower pro point alternative that was still as filling and tasty and I have to say it was gorgeous! It tasted so fresh and juicy I could eat it every day for a week! Spread half the cream cheese and pesto onto one side of the wrap. In a bowl pop the other half of the cream cheese and pesto, balsamic, a splash of water and a little salt and pepper and give a good mix. Add the chorizo, tomatoes, cucumber and peppers to the bowl and mix. 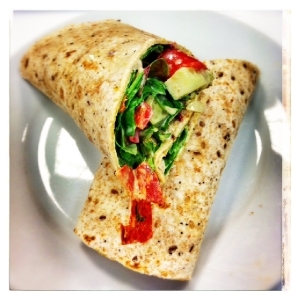 Then pop a few leaves inside the wrap, top with your dressed chorizo salad and wrap up.